Mansfield Cares, Inc. is pleased to invite you to the Mansfield Poker Tour. The event will benefit nonprofit organizations including The ALS Association (ALS) and Muscular Dystrophy Association (MDA). The poker tournament is part of the Ed Tessaro 6th annual Texas Hold’em tournament taking place around the country. 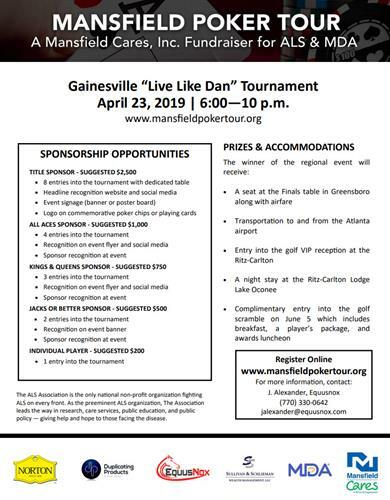 This tournament culminates with the finals to be held at Reynolds/Ritz Carlton Lake Oconee, Greensboro GA on the evening of June 4, 2019. The winner of each regional event will receive a seat at the Finals table at the Reynolds tournament on June 4th. The regional winners will each receive complimentary airfare, transportation to and from the Atlanta airport, a ticket to the VIP reception at the Ritz Carlton Lodge Lake Oconee, a room for one night at the Ritz Carlton Lodge Lake Oconee, and entry into the golf scramble on June 5th which includes breakfast, golf, a player’s package and the awards luncheon. We look forward to having you join us and support a fun poker event for a good cause! April 23, 2019, 6 p.m. - 10 p.m.